Pioneers in the industry, we offer block jointing adhesive from India. We manufacture good quality of Block fixing Material & AAC Block Adhesive to jointing ACC Blocks which is good quality product. Perma Block Fix is a polymer modified adhesive mortar specially designed for thin bed fixing of masonry blocks of various kind including light weight blocks. This product helps in block fixing with thin water tight joints which are strong and give better bonding of the blocks in the masonry. 1. Perma Block Fix is a ready to use material which requires just addition of water on site to make a ready to use mortar. 2. Because of thin bed block fixing one can get extra strong bonding of the blocks and helps in achieving good plumb. 3. Perma Block Fix joints are waterproof hence there is no chance of rising dampness in the masonry. 4. No soaking of the blocks required. No curing required. 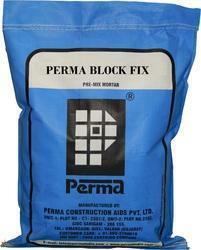 Packing Perma Block Fix is available in 25 kg and 50 kg sacks. Packaging Details: Packing : Perma Block Fix is available in 25 kg and 50 kg sacks. Looking for Block Jointing Material ?